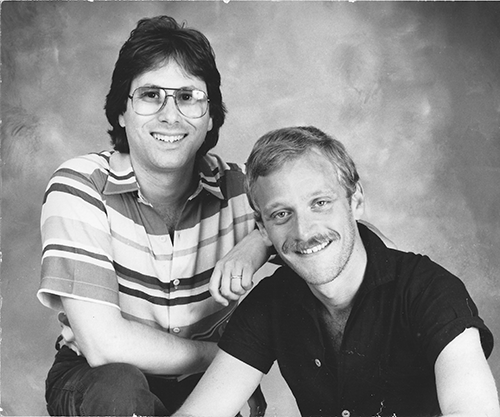 Composer Alan Menken (left) and writer Howard Ashman (right); c. late 1970s. Originally pitched as an animated film by producer and lyricist Howard Ashman to Walt Disney Studios, the story of Aladdin went through many different hands between 1987 and its final release in 1992, resulting in many different scripts, outlines, and treatments. However, the most famous and sought after treatment is Ashman's original 1988 treatment. As he began work on Disney's upcoming feature The Little Mermaid, writer and lyricist Howard Ashman pitched an idea of a possible new animated feature to the studio, and in January 1988, he turned in a 40-page treatment of Aladdin, featuring a complete score, with lyrics by him and music by his frequent collaborator Alan Menken. Though the head of Disney animation at the time called it the best treatment he had ever read, Disney passed on it, and as per Ashman's contract, the company owned both the treatment and the score. Soon after, the story was handed off to writer Linda Woolverton, and, once his work on Mermaid was nearing completion, Ashman, along with Menken, was brought in by studio chairman Jeffrey Katzenberg to save the troubled Beauty and the Beast production. Chosen as a follow up to Mermaid by directors John Musker and Ron Clements, the duo looked through everything that had already been done for Aladdin and decided to combine the best aspects off all the different drafts and treatments, as well as adding more animation friendly characters (namely Abu the monkey and Rajah the tiger), and began working on a new draft of the script. Around this time, it was decided that Ashman and Menken's original score would be used when possible with the duo coming on board to write new material when needed. Also around this time, as Musker and Clements were preparing to fly out to New York (where Ashman lived), Ashman told Musker during a phone call, "I just want to let you know before you come out here… I’ve been ill." (Ashman, who had been diagnosed in 1988 as HIV positive, was beginning to show signs of his illness.) Due to this, the directors, along with producer Don Ernst, flew over and visited Ashman whenever possible to make sure he was involved. Ashman died from complications due to AIDS on March 14, 1991, after completing a few new songs with Menken. Around the same time, the storyboard reel was shown to Jeffery Katzenberg, who told Musker and Clements afterward, "I was so disengaged that all through the movie, I was working on the guest list for my wife’s surprise birthday party!” With the fate of the film in jeopardy, Musker and Clements brought on writers Ted Elliott and Terry Rossio to rewrite the script yet again. Due to this, various story elements were cut or streamlined, resulting in further cuts to Ashman and Menken's score. To fill in the holes now left in the score, Menken wrote various songs by himself, before lyricist Tim Rice was hired to complete the final film score with him. All story problems were successfully worked out by the film's release date of November 25, 1992. In July 2011, a musical theatre version of Aladdin premiered in Seattle, Washington, at the 5th Avenue Theatre. Though restoring much of Ashman's original vision and score, cuts and changes between the show's original production and 2014 Broadway production resulted in various other cuts and edits. For these, writer and lyricist Chad Beguelin supplied the show with new lyrics. On August 14, 2017, LMW founder Dycaite received an anonymous email containing a copy of Howard Ashman's script in its entirety, available for download here. The script is also available for viewing at the Library of Congress, as a part of the Howard Ashman papers, with another copy likely remaining in the Disney Animation Research Library. In the original story, originally set in Baghdad, there were two genies: The Genie of the Ring - who would serve as the film's narrator appear from time to time to comment on and explain various points of the story - and The Genie of the Lamp. Aladdin is actually not an adult; instead, he is about fifteen years old and is motivated by the need to prove to his mother that he is responsible, capable of growing up and making her proud. Babkak, Omar, and Kasim are Aladdin’s gang of friends. Jafar was not “Jafar” yet; instead, he was called The Wazir, and his “smart-mouthed, back-talking sidekick” parrot was named Sinbad. The original love-story of the film would be as follows: while on an epic adventure to save the princess, Aladdin would see Abbi’s love for him manifested as she protects him on his journey. Though he is offered the princess’ hand in marriage after saving her life and the kingdom, Aladdin ultimately refuses in favor of true love with Abbi. Only two songs from Ashman and Menken's original score remain in the final movie: "Arabian Nights", and "Friend Like Me". Arabian Nights: Written to be sung by The Genie of the Ring, who was to be the narrator of the film, it was meant to introduce the setting and tone of the film. Though making the final film, much like The Little Mermaid's "Fathom's Below", it would be cut down. Arabian Nights - Reprise #1*: To be sung by Genie of the Ring and meant to introduce The Wazir. Babkak, Omar, Aladdin, Kassim: To be sung by, and meant to introduce, Aladdin and his friends, Babkak, Omar, and Kassim. Arabian Nights - Reprise #2*: To be sung by Genie of the Ring as The Wazir leads Aladdin to The Cave of Wonders. Friend Like Me: To be sung by Genie of the Lamp as he becomes Aladdin's master. This song would make it to the final film, earning Ashman and Menken their final Oscar nomination together. Call Me a Princess: Sung by Princess Jasmine, a "purely comic" character, after she hears her maids gossiping about her behind her back. The song was reworked by Chad Beguelin for the original Seattle and Toronto productions of the musical, where she uses the song to scare away potential suitors. However, the song was again cut for the Broadway run, replaced by "These Palace Walls." How Quick They Forget*: To be sung by Babkak, Omar, and Kassim after Aladdin abandons them, presumably while trying to gain the love of the princess. Arabian Nights - Reprise #3*: To be sung by the Genie of the Ring, after Aladdin has been imprisoned, the Sultan falsely believing he was in cahoots with the Wazir. High Adventure: To be sung by the Genie of the Ring, Aladdin, Abbi, Babkak, Omar, and Kassim as the group goes to save Princess Jasmine. *indicates that song was not restored in the Broadway production of the stage musical adaptation. The Wazir's Song: To be sung by Jafar / The Wazir and his parrot Sinbad as they're unmasking Prince Ali. Listed on the Aladdin Central website, the lyrics are supposedly from the July 15, 1990, draft of the script and written by Ashman. With what appears to be rough, unfinished lyrics, it's possible that "The Wazir's Song" is Ashman's rough sketch for "Humiliate the Boy" or placeholder lyrics by Musker and Clements, intended to give Ashman and Menken an idea of what they want. Prince Ali: Sung by the Genie of the Lamp (now the only Genie in the film), the song was written by Ashman and Menken were brought back into production. Humiliate The Boy: Sung by Jafar and his parrot, now re-named Iago, it was to take place when Jafar takes over control of Agrabah and unmasks "Prince Ali". This would be the final song Ashman and Menken wrote for the film, as well as their final collaboration.